I have 4 Shetland sheep that I keep as pasture mowers. I don't breed them. We have an acre of land of which half is pasture. The sheep keep it well trimmed so we don't have to mow it. Each year I send one or two batches of fleeces to be processed by Zeilinger's into roving or top. 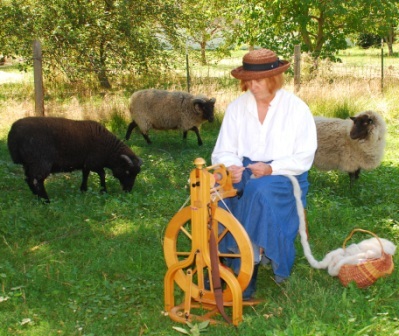 The top is smooth, even, and lovely to spin, but the roving is the more traditional preparation for Shetland fleece. The roving is also lovely to spin, and produces a loftier yarn, with a slight tooth or fuzz in the finished yarn. This fuzz is what is needed to keep the yarn from unravelling in traditional fair-isle steeks. Please email to verify availability. Minimum order is 1 lb, with 4 oz increments above that.